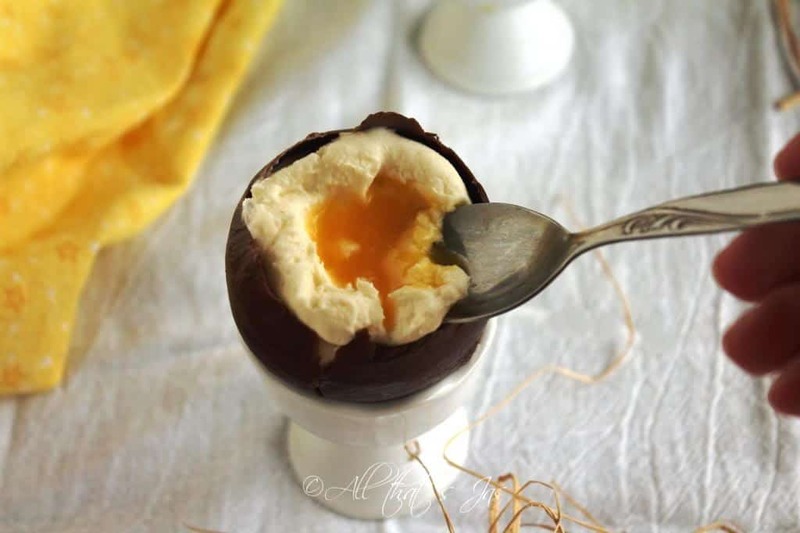 These fun chocolate Easter eggs with cheesecake filling are the perfect treat for kids and adults alike. The sun is shining, everything is blooming and for a long time, you won’t hear me complain about the snow. Is spring also your favorite season? It just puts an extra spring in your step, ya know? 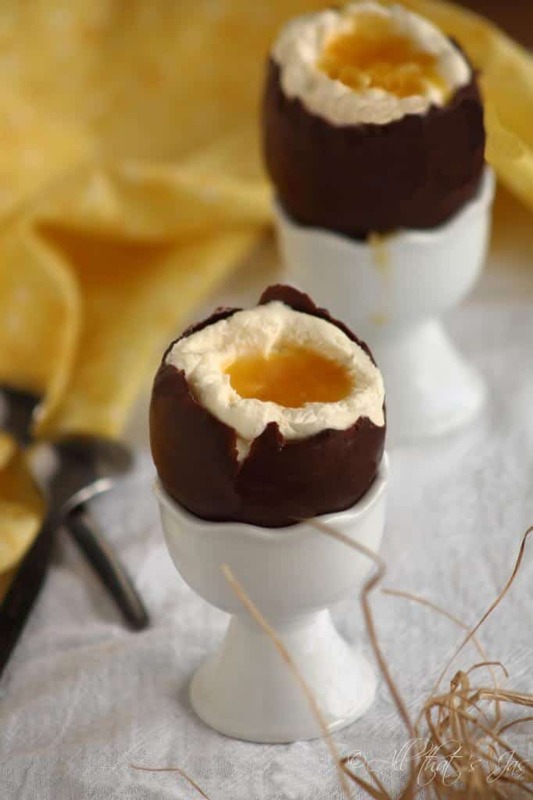 Easter is near and these delicious chocolate eggs are such an easy, cute, yummy, no-bake treat to make. 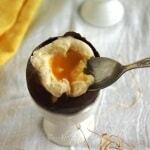 They are filled with creamy lemony cheesecake and apricot sauce for the “yolk”. Genius! My only complaint is that I need to eat a dozen of these chocolate eggs to satisfy my sweet tooth. So, I usually make these for the grandkids and we get another cake, like this no-bake lemon raspberry cheesecake. If you can’t find hollow chocolate eggs, you can make your own using balloons. This takes a bit more effort. Melt or temper chocolate (about 6 oz.). Allow the chocolate to cool for few minutes so it doesn’t feel hot when you touch it. Dip air-filled balloon into the chocolate by holding it by its knot at an angle. Dip to the level you’d like. Tilt the angle the other way and dip again. To create a smooth coat, simply turn the balloon around slowly in the melted chocolate. Pour 1/2 teaspoon of the melted chocolate onto the cookie sheet. make a small circle. Place the dipped balloon onto the circle. Refrigerate balloons for about 30 minutes. To remove the balloon from chocolate, stick a pin or needle at the top and allow the air to expel slowly. Then “peel” the balloon out from the chocolate eggs. Remove all wrapping from 8 hollow chocolate eggs. I suggest using disposable gloves to avoid leaving fingerprints on the outside of the eggs. With a warm knife, carefully remove the tops of the chocolate eggs. It doesn’t have to be perfect. Keep the eggs in the refrigerator until ready to be filled. In a small saucepan, heat the juice, jam, and butter on low heat until the mixture is smooth. Place in the refrigerator. The sauce will thicken slightly. Meanwhile, in a bowl beat the cream cheese, sugar, vanilla sugar or extract, and lemon juice until the mixture is smooth for few minutes. 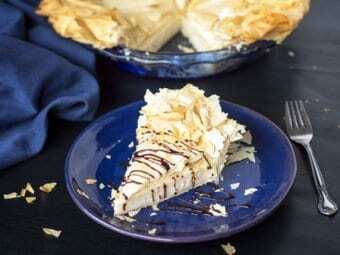 Using a whisk, gently fold in the cool whip or whipped cream until combined. Fill the pastry bag with the cheesecake mixture and using a large tip, pipe some of the fillings into each egg, just below the top. Leave a small depression for the yolk, or scoop out a hole using a back of a small spoon. Fill the hole with some chilled sauce. Place the eggs in an empty egg carton and return to the fridge to chill for at least 30 minutes. 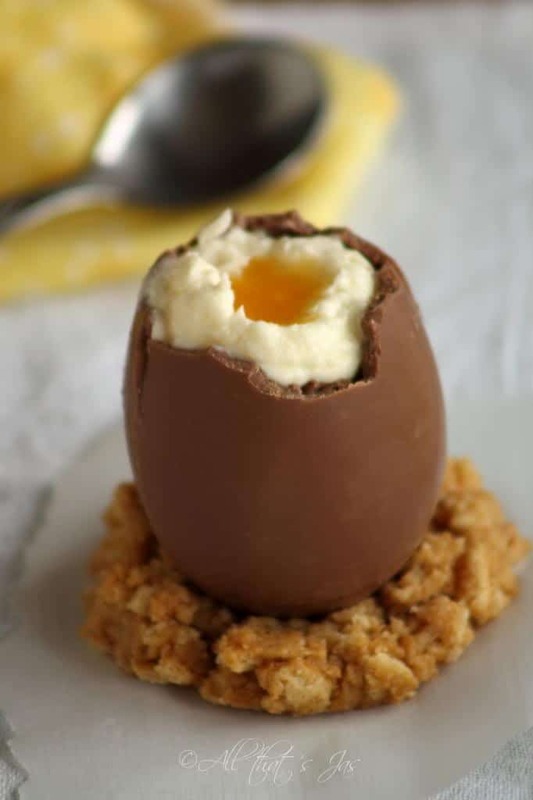 Instead of placing the eggs into egg holders you can make the “nests” with 2 cups graham cracker crumbs, one stick melted butter and 1/3 cup sugar. Mix until well combined and with your hands, shape round nests with middle indent just large enough for the egg to sit in. Remove all wrapping from 8 hollow chocolate eggs. I suggest using disposable gloves to avoid leaving fingerprints on the outside of the eggs. With a warm knife, carefully remove the tops of the chocolate eggs. It doesn't have to be perfect. Keep the eggs in the refrigerator until ready to be filled. If you can't find hollow chocolate eggs, you can make your own using balloons. This takes a bit more effort. Line a cookie sheet with parchment paper. Melt or temper chocolate (about 6 oz.). Allow the chocolate to cool for few minutes so it doesn't feel hot when you touch it. Dip air-filled balloon into the chocolate by holding it by its knot at an angle. Dip to the level you'd like. Tilt the angle the other way and dip again. To create a smooth coat, simply turn the balloon around slowly in the melted chocolate. To remove the balloon from chocolate, stick a pin or needle at the top and allow the air to expel slowly. Then "peel" the balloon out from the chocolate eggs. See this recipe featured on Our Crafty Mom, Mom Always Finds Out, Domestic Deadline, Life With Lorelai, Tickle my Tastebuds, Linky Party, Talented Tuesday, The Fifth Course, Organized 31, Easy Peasy Pleasy, and favored on Creative Muster Party. Thank you so much for creating this…so happy to find a gluten free fun candy to make with my kids. I love this and want to make them for our Sunday Easter dinner. I just need to verify that powdered sugar is the same as icing sugar? What the What! This looks amazing! I had to pin in my Easter Board. LInking up from Hump Day Happenings. 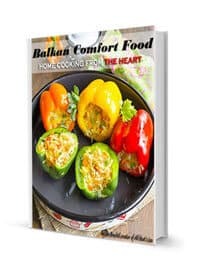 Great recipes I found of yours at Sunday Features. Pinned! Oh.my.goodness! Those look SO yummy! Thanks for linking up with Waiting on…Wednesday! Hope to see you back tomorrow! Thank you, Holly, I will be there with my bells on! Please stop by Thursday for our Thursday Favorite Things Blog Hop! Just stopping by after I saw these on The Bouquet of Talent Linky Party over at Life on Lake Shore Drive. I love this idea, and I am promising myself I will make these for Easter! Thank you, Claire! I know the feeling – I have a long list of recipes I want to try and need to clone myself to make them all in this lifetime, lol. Oh yummm. I enjoyed popping into each of your posts via Grandmas Briefs but this is the best by far – speaks the total Chocoholic grandma 🙂 Have a great week! These are gorgeous! Thanks for linking up to Funtastic Friday. Hope to see you again this week. You had me at Cheesecake filling! Yeah, it’s the best 🙂 Thanks for stopping in, Julie! What a brilliant idea, these look so impressive and so fun to make! I hear you, Joy. But there’s nothing I wouldn’t do for my granddaughters 😀 Have a great weekend! What a great Easter Egg, very special! Hope you have a fantastic weekend and thanks so much for sharing with us at Full Plate Thursday. Cheesecake filling! That sounds delicious, Jas. These are so pretty. Thanks for sharing your wonderful creations with us at Snickerdoodle. Pinning. Thank you, Beverly! Hope your weekend is going great! I LOVE these! Now I can’t decide what Easter treat to make! LOL! Thanks for sharing at the Friday at the Fire Station linkup! This looks so effective! Thanks for sharing with us at #OvertheMoon Link Party. I’ve pinned and shared. Amazing! Love these! Thanks so much for sharing with us at Snickerdoodle! Pinned. I’ll take these over Cadbury eggs any day! YUM! I can feel the pounds clinging to my stomach just looking at the pictures. These look so good. Ha, ha, Debra! I can’t eat as I used to either. Thank you so much, Michelle! I’m ecstatic that you liked my eggs enough to feature them! Wishing you a great weekend ahead! Hi, Jeannee! That is so sweet of you to say 😀 Thank you very much!!! These chocolate Easter eggs are such a sophisticated way to celebrate. 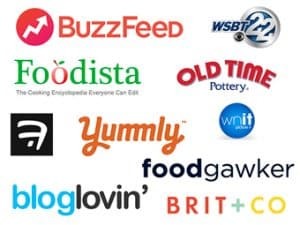 Congrats, you’re featured this week at the #ThisIsHowWeRoll Link Party. Thank you! I am more than thrilled 😀 Hope you have a lovely weekend! I am so tempted to give these a try. They look amazing! They are really fun. Thanks, Carlee.